“How IS the country?” asked my friend Patricia after opening the door to her teeny tiny tony Paris flat. I allowed how it was just fine. “Je DETESTE la campagne!” she announced firmly, indicating that she was not about to come to Martizay to return my visit anytime soon. I understand. For me, a visit to a place where I could see more than three people on the street at the same time was a real treat. There were stores selling things. There were restaurants open, some of them all day. There were cafés with people sitting under heaters on the sidewalk and discussing philosophy (no doubt) for hours over a carafe of the house red. There were little cars with no mud on them whatsoever. But that’s not the only reason why I went around with my mouth hanging open. It was perhaps my tenth trip to Paris, but the beauty suddenly hit me the way a collection agency comes on: suddenly, forcefully, and frequently. It is easy to make fun of the grandiose kings of France, building monuments to their own greatness: the Louvre, the Palais de Justice, the City Hall, the Place des Vosges. Of course it was overbearingly arrogant. Of course they could have done with less. But I am so glad that they bothered. Because we have it now. One avenue after another of remarkable structure and decoration on a very big scale. Unabashed overkill through the Belle Epoque into Art Nouveau. Carvings, gargoyles, polished wood doors, winter flowers, fancy bridges, frosted glass windows, varnished bars … oh come on, jaw, tighten up. After my first $6 Diet Coke in a café, I decided I wasn’t going to think about Parisian prices again for the whole five days. It was very liberating. Men in Paris don’t wear baseball hats. They look great. Happy Hour is not 3 to 5:30 PM but a more civilized 6 to 8 PM. That is sensible! Like Portlanders, Parisians in the rain wear hoods, but all their hoods are trimmed with fur, which gives them instant glamor. Or glamour. Winter sale time is regulated in France: this year it’s January 7 to February 17. 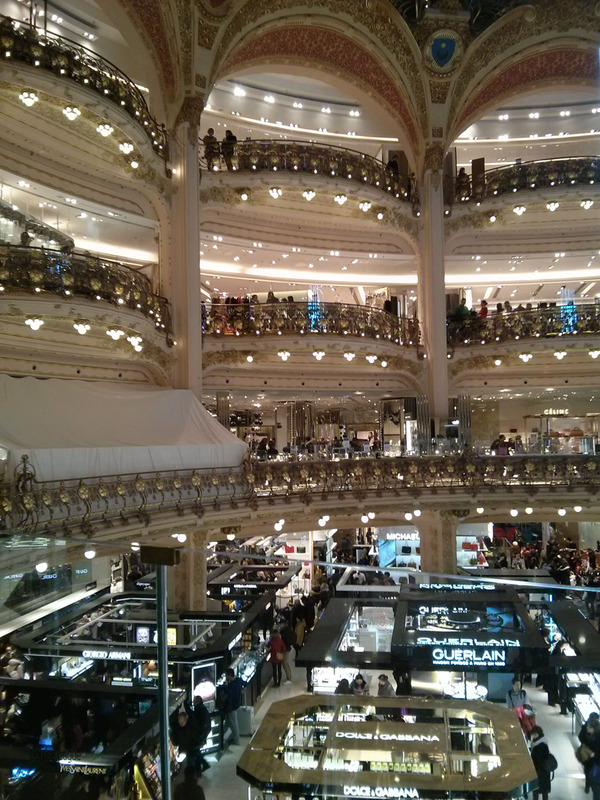 At the very big department store Galeries Lafayette, both gorgeous and zooish, people were waiting in line to get into the Chanel boutique, where 50% off a purse results in a price that’s still measured with four figures. The phrase “politically incorrect” never came up, nor was there any evidence of hostility towards people drinking beer at breakfast, smoking, begging, wearing fur, going vegan, talking to themselves, parking on the sidewalk, buying foie gras, or demonstrating about anything whatsoever. That was cool. 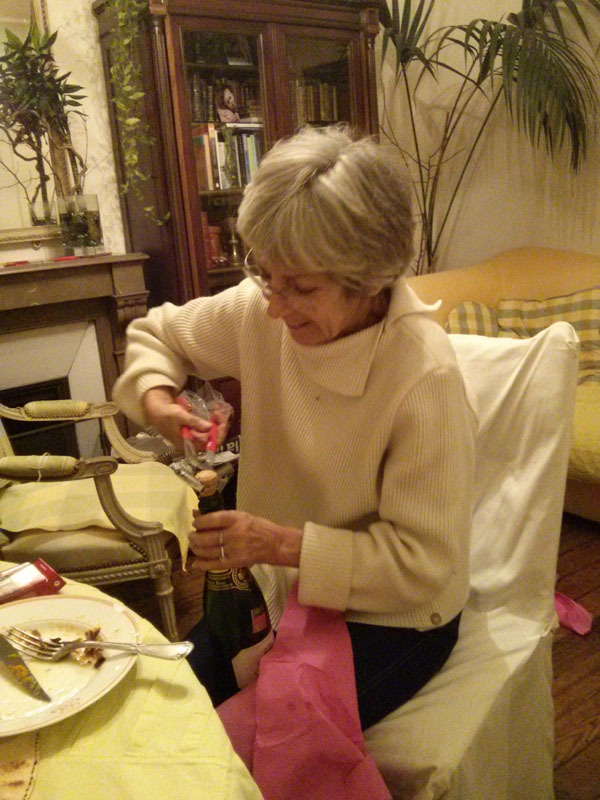 As my hostess Patricia pointed out, there are a great many laws in France, but people don’t pay much attention to them. That must be why there was also a long line outside the Palais de Justice. Like a rose with thorns, Paris does have its dark side. To be beautiful and powerful means to be resented. Being resented can lead to violence. In the train stations and the streets, we now see soldiers in camouflage roaming in threes with their rifles at the ready. The Place de la République had become the official gathering place and protest depository for the Charlie Hebdo assassinations of January 7th. 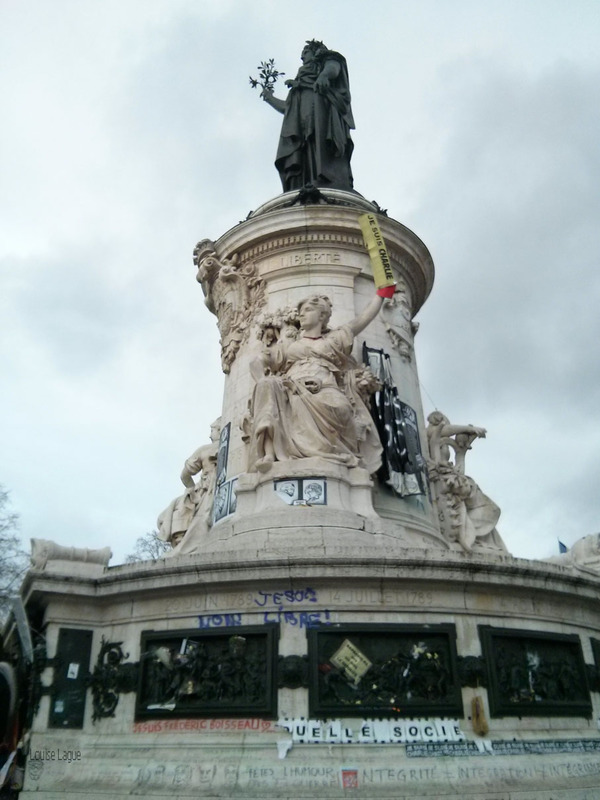 The elegant 1879 monument of city symbol Marianne and Liberte, Egalite and Fraternite is now covered with posters, graffiti, written entreaties, and wilted roses. The heroes of previous revolutions, carved into the pillar, have been incorporated into the protest, now wearing flowers and posters themselves. Monument at the center of the Place de la République. Note Charlie Hebdo placard in place of sword. Tourists and Parisians alike gravely circled the memorial, with nobody moving to clean it up. Nor should they. The French know about living well, and grieving well is part of that. The Place de la République is just where Parisians traditionally gather to express and leave their opinions. Often the traces decompose, but any that don’t will be there permanently and go into the country’s past. We sometimes forget that history is still happening, and that we still need to be vigilant about Liberte, Egalite, and Fraternite. Commons. Image of Parisian café: Olivia’s Paris Odyssey. Chanel counter L&T- I am already looking forward to it! I’m ALWAYS looking forward to it! June? mille sept cent quatre-vingt-neuf – merci! outstanding piece! Merci a vous! Upon further inspection, the monument dates back to 1883; the call for plans was in 1879. Oh, Louise. Your writing is so beautiful. I love it. I feel like I am there (and I have never been to Paris). I have a friend here in Kansas who is also following your blog. She loves it too. I want to hear about the animals and a day in the country. What do you and Tom do all day? Who feeds the goats? Do you get eggs from the chickens? Are you planning the date for our GU lobster bash? I miss you – can’t wait to see you next summer. Thank you for transporting me to Paris, and out of my day-to-day routine for a brief moment. I love your writing. Thank you, Linda and Dorie!